I sketched two of my previous photos from the line drawings over photos in my last post- one was drawn upright and one was drawn upside down. Then I took another photo and sketched it without first adding lines. All 3 were done on one 9 X 12 page with a graphite pencil. All three look like different people and none of them me. The one on the upper right could be my high school year book picture from 50 years ago! I obviously have to practice, practice, practice! I wanted to take an online class in January, when I spend more time at home and more time inside. 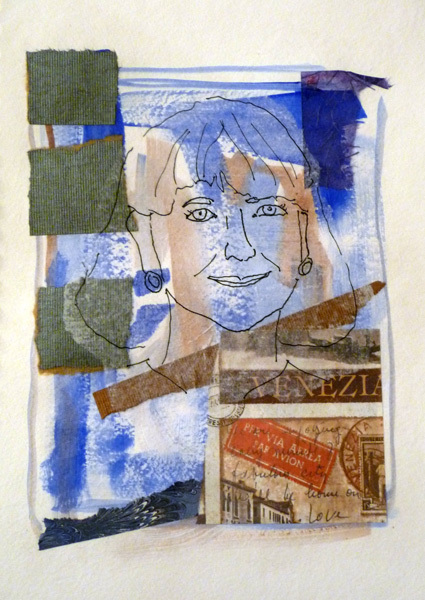 Since I am still working through Carla Sonheims 100 Faces project, and I'd love to be more comfortable with Mixed Media/Collage, I signed up for Jane Davies Self-Portrait class. 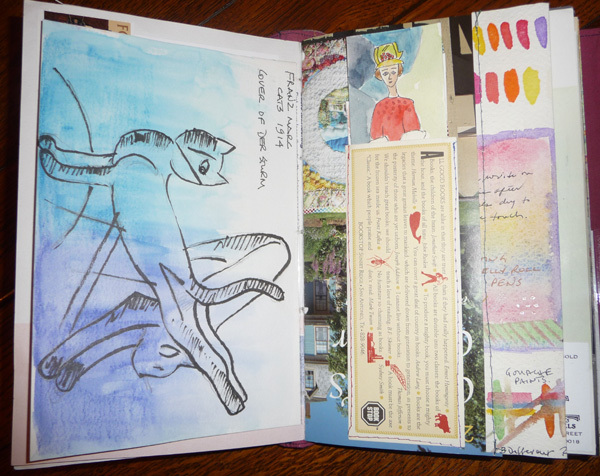 Today I finished four 9X12 journal pages (90 lb watercolor paper in a Strathmore Visual Journal). The basis of each were grayscale enlarged photos of me - taken randomly with hair up and hair down. The goal for this week was to start us working with images of our faces, loosely, in ways that force us to abstract some of the lines and experiment with paint, ink, color, and collage. The first 3 images were drawn and then painted +/- collage on top. The blue paper used for collage in the above self-portrait was made with soy wax on paper and acrylic paint. The 4th image was traced on artist tissue paper and then collaged over a painted/collaged background. Looking forward to our week 2 lesson tomorrow! 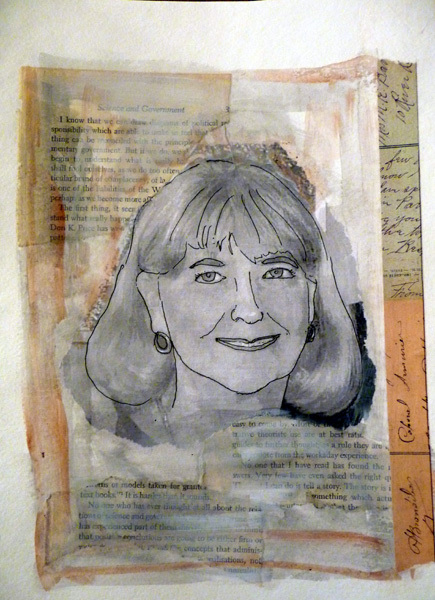 Last year at this time I took the online class "Remains of the Day" by Mary Ann Moss. 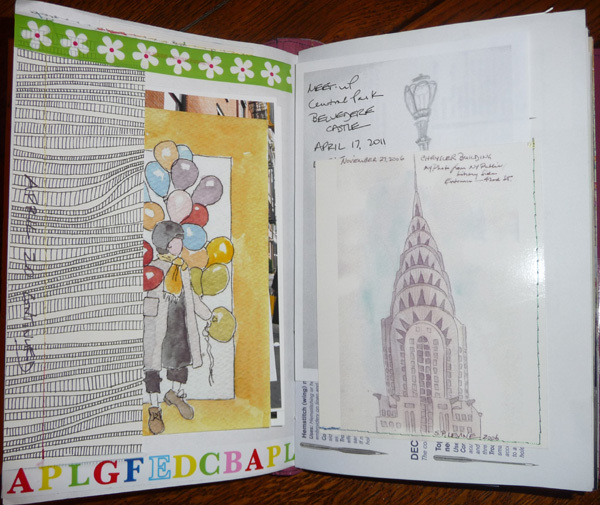 I created a fabric art journal and this year filled it with sketches, photos, and ephemera from my art sketchcrawls and projects with one or more of my New York City friends. 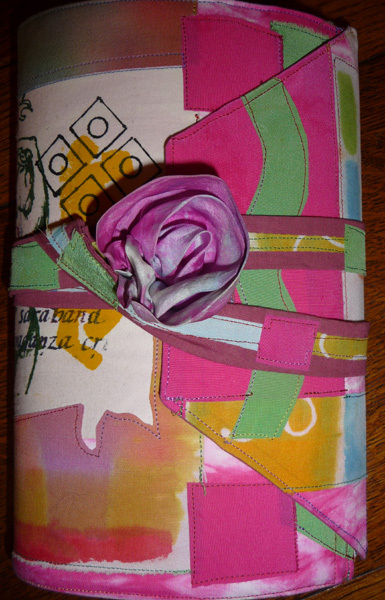 Five of us gather together regularly (Journal Study Group) to share skills for art on paper and art on fabric, and those are the photos that are included. 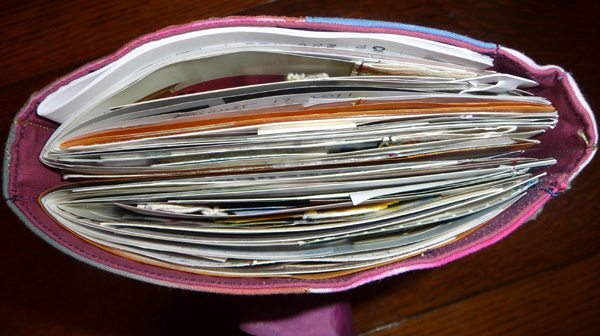 This is my very fat, full journal - which represents many fun days between Jan and Dec. 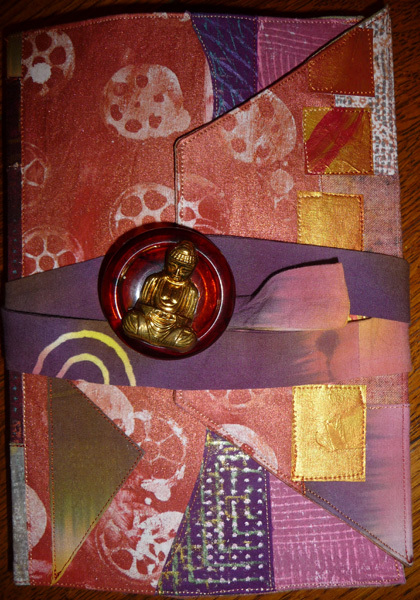 The pages in the journal are made from random printed papers, with lots of other attached decorations. Then more stuff is added. It is hard to explain the multilayered scrapbook quality in photos. But here are a few of the finished pages. 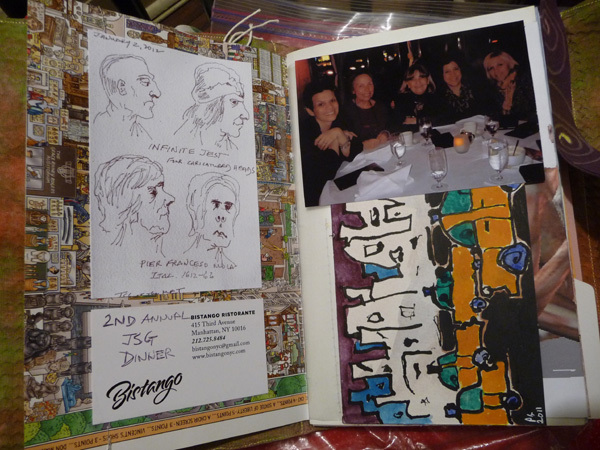 I had so much fun making and keeping this journal, that I decided to make another one for 2012 and to again document my art adventures in New York City. Yesterday I pulled out all of my hand dyed and painted fabrics and made selections for the new cover. And I added my first pages, including my sketches of caricatures in the Infinite Jeste exhibit at the Metropolitan Museum of Art. 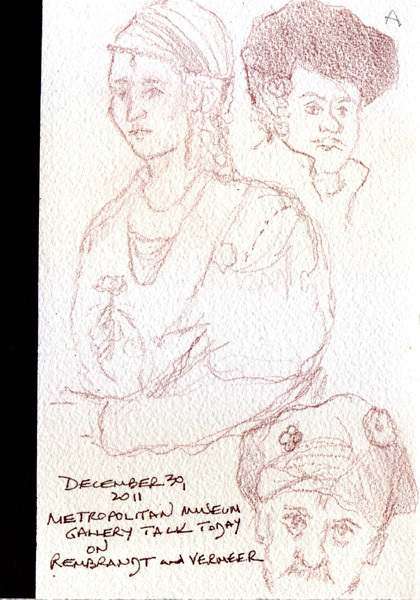 I sketched today during a Gallery Talk on Rembrandt and Vermeer at the Metropolitan Museum of Art. Last January I outlined my art goals for 2011 - just to have a map to guide me through the days. I maintain a sketchbook for pleasure and get joy from recording the little things in my current life. No one is monitoring my progress, but I still like to reflect on how I spent my time, so I can make plans for 2012. Here is my progress on 5 goals. 1. Continue to work on drawing skills with daily drawings and monthly live figure drawing. I averaged more than one sketch per day for the full year, and went to figure drawing monthly at the Society of Illustrators. I also went to figure drawing at the Battery Park City summer program for the first time. Although I want to eventually try using just a brush and watercolor to "draw" figures, I stretched a little and sketched figures, during the 20 minute poses, with a watercolor pencil and then water to shade the figures. I'm working on a 100 Faces project from Carla Sonheim's Drawing Lab book and added 33 portraits - drawing from live people who usually didn't know they were being sketched. I now have almost 70 done. 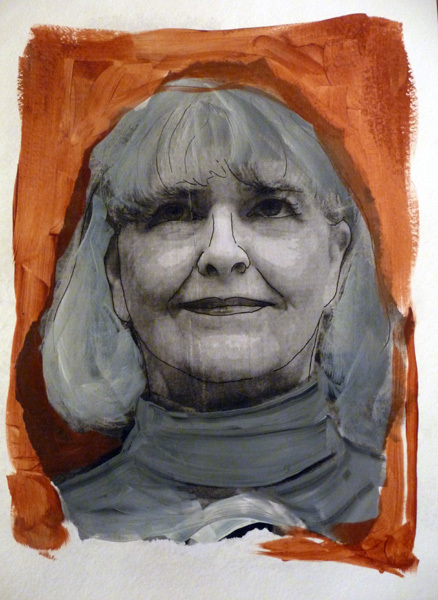 And I even tried sketching portraits of my mother and a few grandchildren, although I still struggle trying to schieve a likeness of their faces. 2. Continue to work on watercolor painting skills. I'm not sure that I'm making progress although I am trying to increase my range of values. And I'm using watercolor pencils more in my daily sketches, especially when I'm sketching faces on subways and buses. 3. 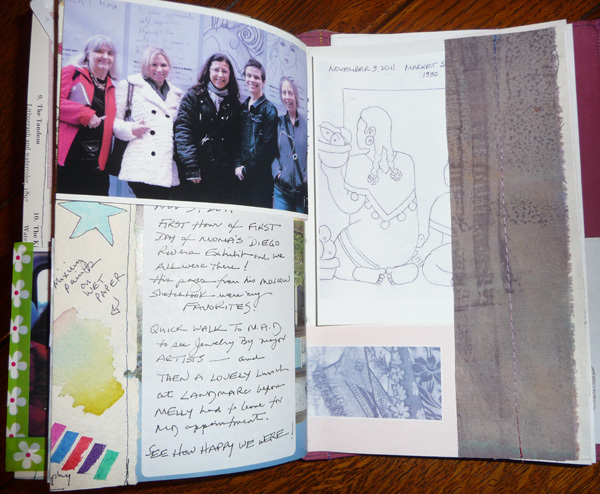 Continue making my daily watercolor sketchbooks and expand my bookbinding skills. I made and used 7 watercolor sketchbooks and one recycled watercolor book during the year and now I'm working on an artist's book - collaging, drawing, and painting Christmas ornaments that I made over the last 30+ years to document my collection. 4. Continue education through on line classes, workshops, and directed reading. Participated in the three 2011 Strathmore online workshops. 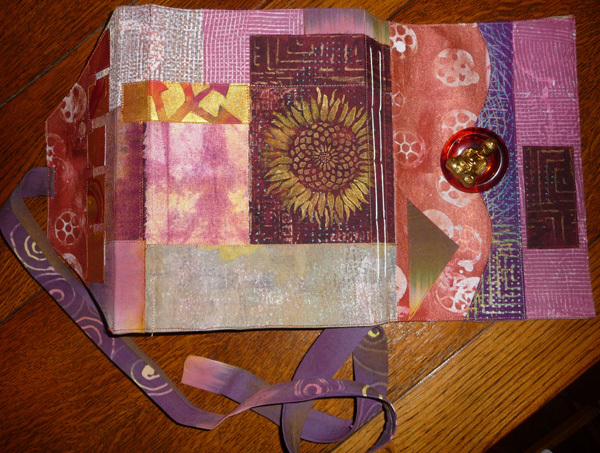 Took an online class with Mary Ann Moss to make a "Remains of the Day" journal and then slowly filled it over the entire year. 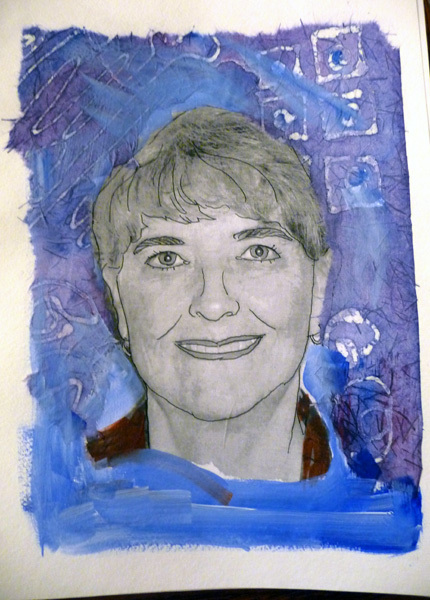 Took a class with Judy Coates Perez at Quilt Festival, painting and drawing on fabric with Tsukineko inks. 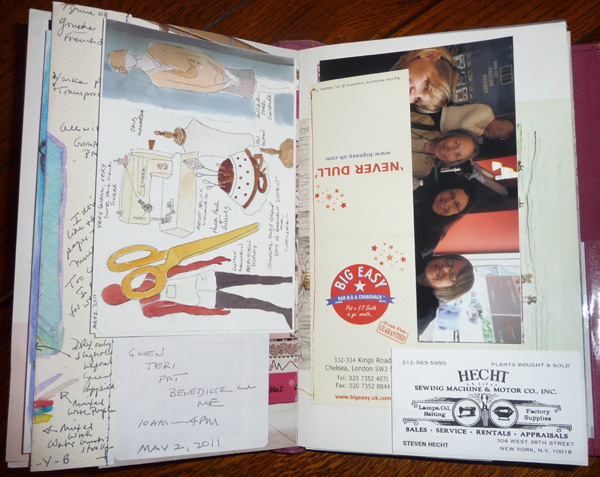 Worked through several DVDs on Art Journals, Read Cathy Johnson's Artist's Journal Workshop twice, Reread Twyla Tharp's The Creative Habit, Read Eric Maisel's Coaching the Artist Within and Peter Steinhart's The Undressed Art or Why We Draw. 5. Enjoy and nurture connections to the art community. I blogged 8-9 times per month (2X/wk), met regularly with members of my Journal Study Group to visit museum exhibits, go on sketchcrawls, and "make art" together, attended 8 Central Park Sketching and Art Meetup Group sessions, and followed Everyday Matters (Yahoo Group) and many art blogs for inspiration and contact with the broader community. I'm am thoroughly enjoying my retirement and I'm thrilled that I found another passion to add to my other lifelong interests. My blog will be 6 years old next week and hopefully I will make some plans for 2012 by then. Christmas weekend we took several of our New York City grandchildren to special programs. Five year old Callum needs some separate time with us, i.e. without big sister Sydney and big brother Henry, so we planned a movie date to see The Muppets. 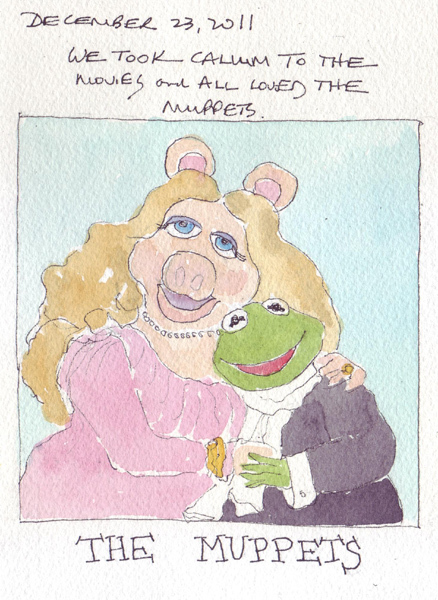 This was very nostalgic for us - since we watched the Muppet Show with our children every Sunday night and took them to see the first Muppet Movie. I had tears in my eyes during the reprise of "Rainbow Connection." Squirmy Callum sat at the edge of his seat with rapt attention. 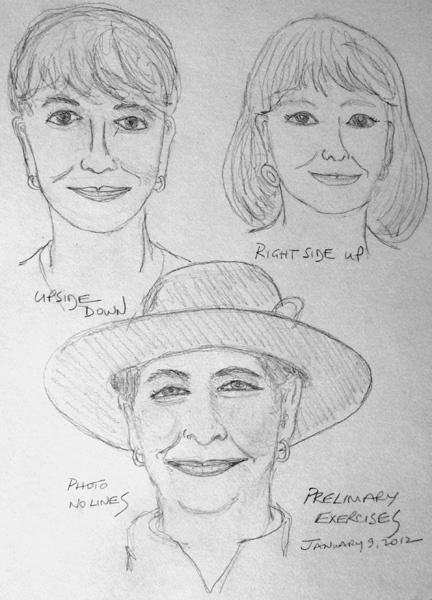 This is a web image of our favorites - that I sketched to remember the day. 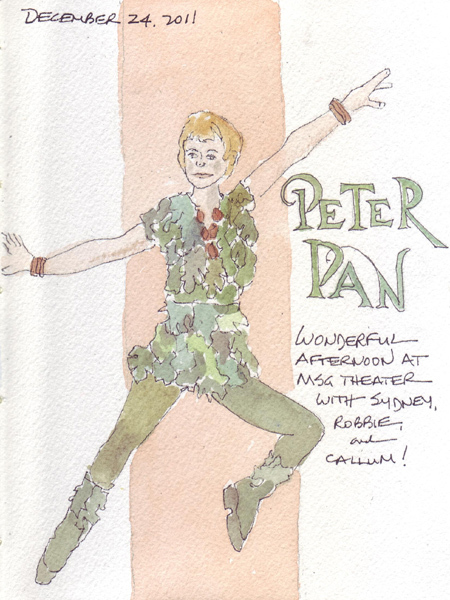 The next day we took Sydney, Robbie, and Callum to see Cathy Rigby in Peter Pan. I played the part of Peter in our 6th grade public school production and saw Mary Martin in the role at about the same time. Syd watches my videotape of that Broadway Show (from when it was rebroadcast during the decades of VCR) at least once per month in my apartment and also knows all the songs. Cathy Rigby was even better than Mary Martin and her gymnastic abilties at age 59, during the flying sequences, were not to be believed. I sketched this from the program cover to create a sketchbook page for the day. We talked to our DC grand daughter multiple times over the weekend, and my son sent this photo of Princess Annabelle - dressed in the sparkly princess dress that I made her for Christmas. She is also wearing the tiara I found for her at the NY Union Square Christmas Market, and the earrings that her other Grandma gave her to complete the outfit. 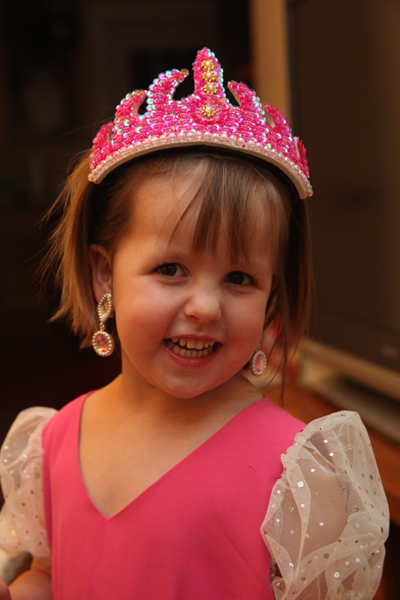 We also have photos of her putting Princess spells on various things with the wand that matches the tiara. We are going to meet her new baby brother William this week. 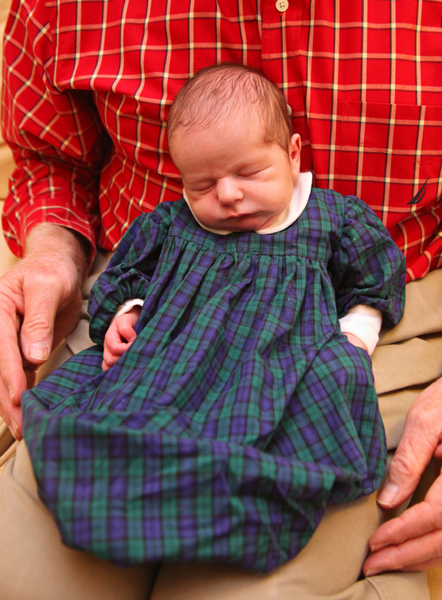 My son also sent a photo of him in the blackwatch baby gown that he requested that I make for their family "blackwatch" Christmas Day morning celebration. So glad that it fit! I would like to wish everyone a Happy and safe New Year's Eve celebration, and a joyous and artistically productive 2012. We have our 5 NYC grandchildren here (without parents) for a New Year's Eve party and sleepover - the very best way that my husband and I can think of to welcome each new year.